In my experience of being an obese person, one of the most insidious effects of fast, processed carbohydrates was to make you want more and more of them. “Want” is probably the wrong term as it suggests there was some sort of choice in the matter and to my mind there wasn’t much choosing by me, it seemed to happen without my noticing that my portions of carbohydrate got larger and larger. By the time I reached my heaviest, I would think nothing of cooking an entire 500g packet of spaghetti for two of us and then eating most of it myself. My portion would barely fit on the plate and, after I had finished it, moving around was quite uncomfortable for a while. But that was the amount of spaghetti I had to eat to feel like I had eaten enough. I didn’t worry that so much spaghetti was making me over weight because spaghetti has no fat in it and it’s fat that makes you fat, right? Wrong. That amount of carbohydrate was massively spiking my insulin, forcing me to store almost everything I ate; storing the energy from the carbohydrate as fat, and a lot of it too. What’s worse is that when the insulin had done its job and stored everything away, my blood was then low in glucose and within a couple of hours I was hungry again. So the cycle of weight gain goes round and round and potions get ever larger to try to stop the feelings of hunger but larger portions make you MORE hungry, not less. Today the Guardian tells us that a portion for spaghetti is about the size of a tennis ball at 150g. I don’t know what the weight was of the portions I used to eat but they were more like a volley ball size than a tennis ball. I do know what my recommended portion size is for spaghetti now is though. 0g. Enjoy. Yesterday the World Health Organisation has published its Global Report on Diabetes which estimates that 422 million people people worldwide were suffering from diabetes in 2014. – Diabetes caused 1.5 million deaths in 2012. – Higher-than-optimal blood glucose was responsible for an additional 2.2 million deaths as a result of increased risks of cardiovascular and other diseases, for a total of 3.7 million deaths related to blood glucose levels in 2012. – Many of these deaths (43%) occur under the age of 70. – In 2014, 422 million people in the world had diabetes – a prevalence of 8.5% among the adult population. – The prevalence of diabetes has been steadily increasing for the past 3 decades and is growing most rapidly in low- and middle-income countries. 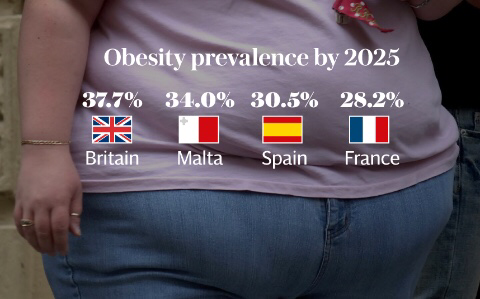 – Associated risk factors such as being overweight or obese are increasing. – Diabetes is an important cause of blindness, kidney failure, lower limb amputation and other long-term consequences that impact significantly on quality of life. For the last 40 years in the western world at least, our governments have been issuing nutritional advice and guidelines as to the types and amounts of food we should eat while at the same time we have got more and more over weight and more and more unwell. Now the developing world appears to be playing catch up with us. Can it really be the case that millions and millions of people have been deliberately ignoring the advice that their governments have been giving them? I doubt it and the evidence is that calorie intake has gone down and exercise levels have gone up. Which is exactly what the WHO is calling for in its report. But if that is what has already happened and diabetes has gone UP, what is the point of asking for more of the same? In my view and my personal experience, it is the ADVICE that is wrong. Not the exercise more bit, we should all do that, but the advice about what we should be eating. Advising people to eat a low calorie and low fat diet is the same as advising them to eat a high carbohydrate diet and a diet high in carbohydrates increases insulin production and promotes fat storage. A diet high in fast carbohydrates such as sugar, may lead to the development of diabetes. So why do governments continue to promote this type of diet when all the evidence suggests that it is making us seriously ill. The Guardian has published a summary of the case against the nutritional establishment, funded by the food industry and determined to silence those who question the evidence that has supported the dietary guidelines. Its a sorry story of ruthless personal ambition mixed with very poor science and an absolute determination to never admit that you might have been wrong. And its killing 422 million people.